Diliana Atanassova is member of the Copus dei Manoscritti Copti Letterari project (Hamburg/Rome) and research fellow at the Department of Biblical Studies and Ecclesiastical History, Faculty of Catholic Theology of the Salzburg University. N.B. : A much longer (and slightly different) version of this article appeared in Coptica 9 (2010) 1-23. This portion is published with the permission of the editor. Already at the beginning of my research in the field of Coptic Liturgy, my interest in studying the typika of the White Monastery, available only in dispersed fragments, was awoken. Working on the Sahidic lectionaries I soon realized that one could not analyze the lectionaries without taking into consideration the typika and vice versa. 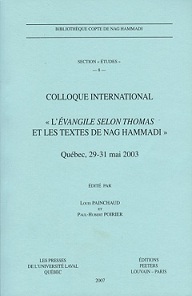 At the Eighth Congress of Coptic Studies in Paris 2004, I emphasized the importance and usefulness of the comparison between these two liturgical sources. In the following years, my efforts in investigating the typika increased. 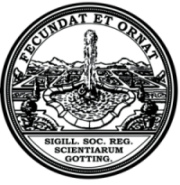 In 2007, this resulted in a research project, which was carried out at the Department of Biblical Studies and Ecclesiastical History at Salzburg University and funded by the Austrian Science Fund (FWF). Preliminary notes and detailed results were reported regularly in national and international gatherings of the scholars. In order to reconstruct the original liturgical codices, I started to use the abbreviation system developed by Tito Orlandi in his Corpus dei Manoscritti Copti Letterari (Rome) (CMCL). The White Monastery’s codices with liturgical typika have the sigla MONB.AW and MONB.NP, as well as all letters from MONB.WA to MONB.WT. In this article, the CMCL sigla for the parchment typika are quoted only with the inventory numbers of their core leaves (cf. here 6). The complementary leaves can be looked up in a forthcoming volume of the Jerusalemer Theologisches Forum (Münster). In the following lines, I shall introduce to our readers some important issues for the understanding of the Coptic typika from the White Monastery. Stephen Emmel describes a liturgical typikon as “a book containing a list of lections for church services, arranged according to the liturgical calendar. As distinct from a lectionary, a typikon gives not the full text of any lection, but only the opening words and a cross-reference to where the full text can be found.” However, this definition is too narrow since the typikon do not only include biblical or patristic lections but also other liturgical texts such as different chant types. For this reason, parts of such manuscripts are sometimes also named “directories” or “indices”. 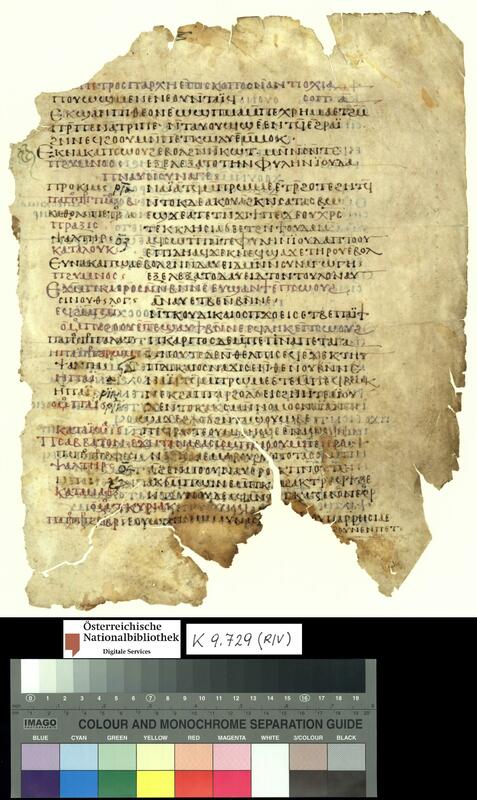 Following Hans Quecke, one of the foremost specialists in Coptic liturgical manuscripts, the term “typikon” is preferred among the German and English writing scholars. In my studies I am using both terms: “typikon” as to name the entire codex, and “directory” in order to differentiate between the distinct parts of the codex, as for example “directory of pericopae” and “directory of hymns”. Investigations on the typikon fragments revealed that “typikon” needs to be defined more precisely. Typika have two important characteristics. Firstly, they represent only incipits or desinits of liturgical texts. In addition, these are listed according to the liturgical calendar. The incipits of lections mainly derive from the Psalter and the NT. This refers to the fact that the typika leaves give the biblical readings for the Liturgy of the Word during the Mass and sometimes the Morning and Evening services (Liturgy of the Hours) as well. The frequency of the Psalter incipits is a result of the importance of this book in the Coptic Liturgy. Firstly, a psalm can be used as a “prokeimenon” that precedes the readings from the NT. Secondly, it can be used as a psalm reading, as is usual in the Coptic liturgy, before the reading of a Gospel. Finally, a psalm can be taken as a hymn for the dismissal of the liturgy. Being Psalms, these hymns are given different names, such as hymnos (always in Greek) and hermenia (always in Coptic). The meaning of the latter is still not clear. Apart from the incipits of biblical passages, the typika also give the incipits of homilies (kathegesis) of different Church Fathers. However, most of these homilies belong to the Discourses (logos) of Apa Shenoute of Atripe. In his study on Shenoute, Emmel already pointed out how important the incipits of Shenoute Discourses surviving on typikon fragments are for the reconstruction of the works of Shenoute. Last, but not least the typika preserved incipits of ecclesiastical chants, which were used for the dismissal of the service and were called hymnos as well. The full text of these poetical compositions can often be found in the same codices as the typikon fragments. They frequently bear the still puzzling terminus technicus “poiekon”. For the same pieces of church poetry the typika used both terms “hymnos” and “poiekon”. This problem requires further investigation. In a second means of displaying the content, the text is represented in one column where every new cross-reference with its incipit immediately follows the previous one. Here color plays a most important role. In this type, which occurs rarely, only the color red, or red and yellow distinguish the cross-references from the incipit readings. Examples for the second type are codices like MONB.WIand MONB.WQ, MONB.WN. These are just a few formal characteristics that allow the identification of typikon fragments within the large amount of Coptic manuscripts. So far, a comprehensive monograph on the typika of the White Monastery has been missing. In the past, there were a few very important articles on the subject, most of them written by Hans Quecke and Ugo Zanetti. The data for the typikon leaves of the White Monastery can be found in the works of these two leading scholars in the study of Coptic liturgical manuscripts and in manuscript catalogues. I am designating the entirety of these data as “the main typikon corpus”. In the course of my research, I was able to present these data in a preliminary list with inventory numbers. At first, these numbers were divided into two groups. In one group, I gathered the call numbers of the leaves with pericopae, and in the other, I listed all the fragments with all the hymns including “hermeneiai”, “hymnos”, “trisagios” and “poiekon” chants. In studying the different parts of the codex with typika (cf. here point 5), I distributed the typikon fragments according to the part of the codex they belong to. The preliminary list mentioned above includes 135 fragments altogether. Meanwhile number of leaves increase. At this time, there are 61 leaves or fragments with pericopae, 78 with hymns, including “hermeneiai” and their responsory and other ecclesiastical poetry and 55 with “trisagios” and “poiekon” chants. The leaves that belong to the still unstudied parts of a liturgical codex with typika have not been taken into account, because their investigation is just beginning. During my employment on the Project “Biblia Coptica” from 1997 until 2004, I was particularly entrusted with the Sahidic lectionaries, cf. Schüssler, Biblia Coptica 1,4, VII and 3,2, VII. Some of my observations on the Sahidic lectionaries were presented in 2000 at the 7th Congress of Coptic Studies in Leiden, cf. Atanassova, “Zu den sahidischen Pascha-Lektionaren”, 607-620. Until 2004, the typika manuscripts were not part of the project “Biblia Coptica”, though they have always remained my personal study. Cf. Atanassova, “Beobachtungen zu einigen sahidischen Jahres-Lektionaren”, 391-404. 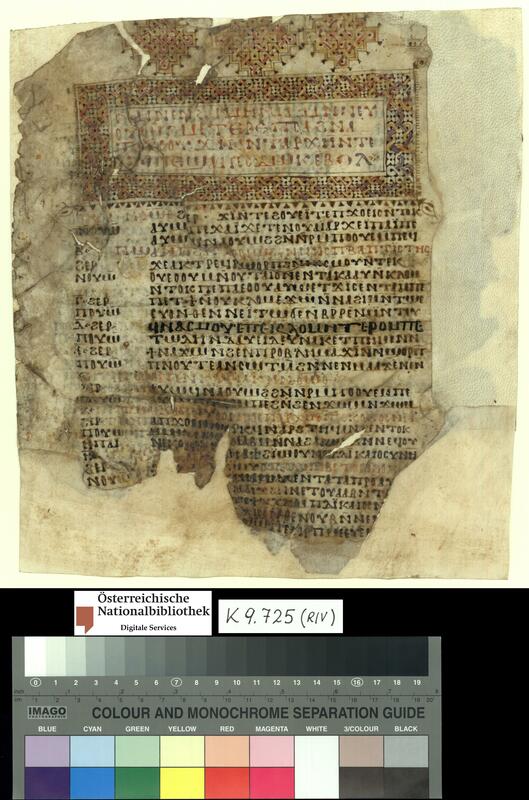 Hans Quecke has successfully used the comparison of these two liturgical sources in his “Palimpsestfragmente eines koptischen Lektionars”, 5-24, in order to reconstruct liturgical rubrics or pericopae. Grant P 20143 with the title “Der Gottesdienst des Schenute-Klosters anhand der koptischen (sahidischen) Typika. Edition. Kommentar. Untersuchung” was established with the support of Dietmar W. Winkler. Symposium Vindobonense, 17 – 20 November 2007 in Vienna; 9th International Congress of Coptic Studies, 14 – 20 September 2008 in Cairo; Third International Congress of Society of Oriental Liturgy, 26–30 May 2010 in Volos (Greece) and last but not least the 11th St. Shenouda Conference of Coptic Studies, UCLA, 17–18 July 2009 in Los Angeles. 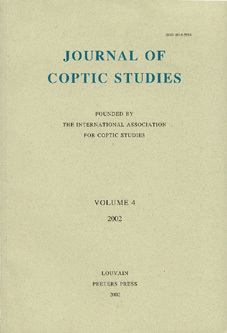 Cooperation with Tito Orlandi began at the Congress of Coptic Studies in Cairo, 2009. Emmel, Shenoute’s Literary Corpus, 75. Brakmann, “Neue Funde und Forschungen zur Liturgie der Kopten, 1996-2000”, 589, 591; Zanetti, “Index”, 55 et al. Quecke, Stundengebet, 76, n. 123. Quecke, “Psalmverse als »Hymnen« in der koptischen Liturgie?”, 101-114. Drescher, “The earliest biblical concordances”, 63-67; Zanetti, “Liturgy in the White Monastery”, 201-210, particularly 206-207. Urbaniak-Walczak, “„Hermeneiai“-Fragmente oder den „Hermeneiai“ verwandte Texte”, 647-653. Emmel, Shenoute’s Literary Corpus, 75-85. Zanetti, “Liturgy in the White Monastery”, 207. Cf. the liturgical heading with Humnos in MONB.WG, Rom, BAV, Borgia copto 109, cass. XXIV, fasc. 102, f. 1v, 15-17. It is followed by poetical strophes entitled with poihkon. Codex MONB.WA consists of four leaves. Its core is Wien, ÖNB, P.Vindob. K 9728. Codex MONB.WC consists of eight leaves. Its core is Wien, ÖNB, P.Vindob. K 9725. Codex MONB.WI consists of twenty-seven leaves. Its core is Wien, ÖNB, P.Vindob. K 9735-9736. For MONB.WQ, cf. here point 6.3. In order to distinguish readings and feasts, the codex MONB.WN uses only a supralinear line. Today it consists of only one leaf Wien, ÖNB, P.Vindob. K 9718 recently edited by Zanetti, “Six Typika”, 263–267. The articles by H. Quecke und U. Zanetti, which are important for the typika investigations, can be found in the Bibliography. Cf. 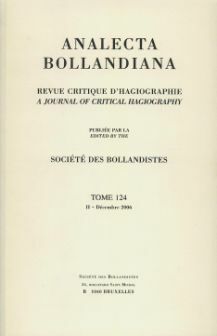 the catalogues by Boud’hors, Ciasca, Crum, Delaporte, Hebbelynck/Lantschoot, Layton, Lefort, Louis, Mingarelli, Munier, Wessely, Zoëga. This list is to be found in Atanassova, “Die Typika des Schenute-Klosters: Die Vorstellung eines Projektes”. Atanassova, D., “Zu den sahidischen Pascha-Lektionaren”. ICCoptS 7, 607-620. Atanassova, D., “Beobachtungen zu einigen sahidischen Jahres-Lektionaren”. 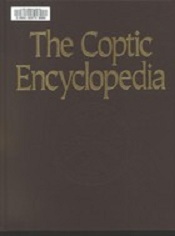 ICCoptS 8, 391-404. Atanassova, D., “Die Typika des Schenute-Klosters: Die Vorstellung eines Projektes”. 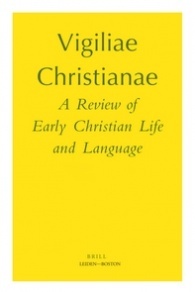 In: Liturgies in East and West: Ecumenical Relevance of Early Liturgical Development – Scholarly International Symposium Vindobonense, Vienna, November 17 – 20, 2007, ed. by Hans-Jürgen Feulner. (Austrian Studies of Liturgy and Sacramental Theology) Wien forthcoming. 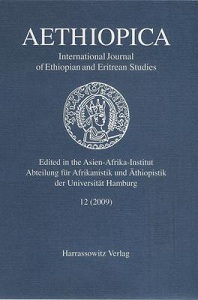 Brakmann, H., “Neue Funde und Forschungen zur Liturgie der Kopten, 1996-2000.” ICCoptS 7, 575-606. Drescher, J., “The earliest biblical concordances.” BSAC 15 (1958-1960) 63-67. Emmel, St. L., Shenoute’s Literary Corpus. 1-2. (CSCO 599-600/111-112) Louvain 2004. Quecke, H., Untersuchungen zum koptischen Stundengebet. (PIOL 3) Louvain 1970. Quecke, H., “Palimpsestfragmente eines koptischen Lektionars (P. Heid. Kopt. Nr. 685).” Le Muséon 85 (1972) 5-24. 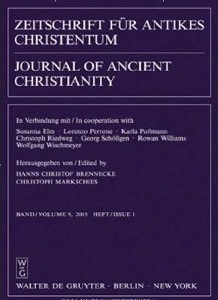 Quecke, H., “Psalmverse als »Hymnen« in der koptischen Liturgie?” In: Christianisme d’Égypte. 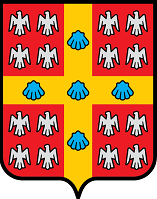 (CBCo 9) Paris-Louvain 1995, 101-114. Schüssler, K., Biblia Coptica. Die koptischen Bibeltexte. Das sahidische Alte und Neue Testament. Bd. 1, Lieferung 4: sa 93-120. Wiesbaden 2000. Schüssler, K., Biblia Coptica. Die koptischen Bibeltexte. Das sahidische Alte und Neue Testament. Bd. 3, Lieferung 2: sa 521-540. Wiesbaden 2003. Urbaniak-Walczak, K., “„Hermeneiai“-Fragmente oder den „Hermeneiai“ verwandte Texte aus Deir El-Naqlun (Faijum)”. 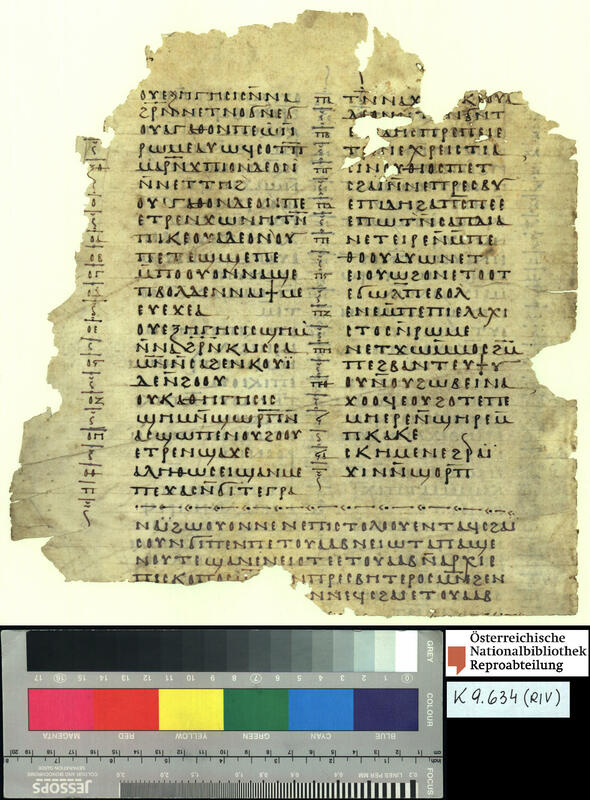 ICCoptS 7, 647-663, Abb. I-III. Zanetti, U., “Un index liturgique du Monastère blanc.” In: Christianisme d’Égypte. (Hommages à Renè-Georges Coquin). (CBCo 9) Louvain 1995, 55-75. Zanetti, U., “Liturgy in the White Monastery”. In: Christianity and Monasticism in Upper Egypt. Volume 1: Akhmim and Sohag, ed. by Gawdat Gabra and Hany N. Takla. Cairo New York 2007, 201-210. 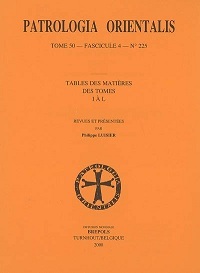 Zanetti, U., “Leçons liturgiques au Monastère Blanc: Six Typika.” BSAC 46 (2007) 231-304. This entry was posted in Articles, Bible, Guest Post, Liturgical Books, Monasteries, Shenoute of Atripe and tagged CMCL, codicology, Coptic Manuscripts, Diliana Atanassova, liturgy, Psalms, Sahidic, White Monastery. Bookmark the permalink.